device that converts chemical energy into electrical energy, consisting of a group of electric cells that are connected to act as a source of direct current. ..... Click the link for more information. , which in turn are grouped into organs and organ systems. 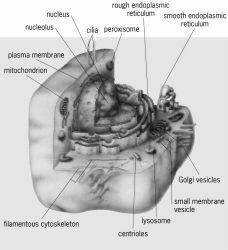 , a cell or organism composed of cells that have a membrane-bound nucleus and organelles (mitochondria, chloroplasts; see cell, in biology) and genetic material organized in chromosomes in which the DNA is combined with histone proteins. taxonomic kingdom that comprises the prokaryotes (bacteria and cyanobacteria). Prokaryotes are single-celled organisms that lack a membrane-bound nucleus and usually lack membrane-bound organelles (mitochondria, chloroplasts; see cell, in biology). concept that embodies the belief that existing animals and plants developed by a process of gradual, continuous change from previously existing forms. This theory, also known as descent with modification, constitutes organic evolution. ..... Click the link for more information. ). All organisms other than cyanobacteria and bacteria consist of one or more eukaryotic cells. the structural unit of inheritance in living organisms. A gene is, in essence, a segment of DNA that has a particular purpose, i.e., that codes for (contains the chemical information necessary for the creation of) a specific enzyme or other protein. any of the group of highly complex organic compounds found in all living cells and comprising the most abundant class of all biological molecules. Protein comprises approximately 50% of cellular dry weight. a broad class of organic products found in living systems. Most are insoluble in water but soluble in nonpolar solvents. The definition excludes the mineral oils and other petroleum products obtained from fossil material. ..... Click the link for more information. molecules, that controls the flow of materials into and out of the cell. , process in which green plants, algae, and cyanobacteria utilize the energy of sunlight to manufacture carbohydrates from carbon dioxide and water in the presence of chlorophyll. Some of the plants that lack chlorophyll, e.g. , in biology, process by which substances are taken into the cell. When the cell membrane comes into contact with a suitable food, a portion of the cell cytoplasm surges forward to meet and surround the material and a depression forms within the cell wall. chief constituent of the cell walls of plants. Chemically, it is a carbohydrate that is a high molecular weight polysaccharide. Raw cotton is composed of 91% pure cellulose; other important natural sources are flax, hemp, jute, straw, and wood. ..... Click the link for more information. secreted by the cell. A magnifying glass, an ordinary double convex lens having a short focal length, is a simple microscope. The reading lens and hand lens are instruments of this type. , 1632–1723, Dutch student of natural history and maker of microscopes, b. Delft. His use of lenses in examining cloth as a draper's apprentice probably led to his interest in lens making. , 1635–1703, English physicist, mathematician, and inventor. He became curator of experiments for the Royal Society (1662), professor of geometry at Gresham College (1665), and city surveyor of London after the great 1666 fire. , 1628–94, Italian anatomist. A pioneer in the use of the microscope, he made many valuable observations on the structure of plants and animals. , 1804–81, German botanist. He was professor at the universities of Jena (1839–63) and Dorpat (1863–64). With Theodor Schwann, he is credited with establishing the foundations of the cell theory. , 1810–82, German physiologist and histologist. He was a student of J. P. Müller and professor at the universities of Louvain (1838–48) and Liège (from 1848). ..... Click the link for more information. developed what is now known as the cell theory. The theory was widely promoted after the pronouncement by Rudolf Virchow in 1855 that "omnis cellulae e cellula" [All cells arise from cells]. The study of cell structure came to be called cytology and that of tissues histology. In the 20th cent. appreciation of the biochemistry of the cell has flourished, along with a better understanding of its structure; cell biology now integrates both chemical and structural information. science concerned chiefly with the chemistry of biological processes; it attempts to utilize the tools and concepts of chemistry, particularly organic and physical chemistry, for elucidation of the living system. See L. Thomas, The Lives of a Cell (1974); D. M. Prescott, Cells (1988); B. Alberts et al., Molecular Biology of the Cell (2d ed. 1989); J. M. Lackie and J. A. Dowe, ed., The Dictionary of Cell Biology (1989). Eubacteria contain a single circular double-stranded molecule of deoxyribonucleic acid (DNA), or a single chromosome. As prokaryotic cells lack a nucleus, this genomic DNA resides in a central region of the cell called the nucleoid. The bacterial genome contains all the necessary information to maintain the structure and function of the cell. Many bacteria are able to move from place to place, or are motile. Their motility is based on a helical flagellum composed of interwoven protein called flagellin. The flagellum is attached to the cell surface through a basal body, and propels the bacteria through an aqueous environment by rotating like the propeller on a motor boat. The motor is reversible, allowing the bacteria to move toward chemoattractants and away from chemorepellants. In a light microscopic view of a eukaryotic cell, a plasma membrane can be seen which defines the outer boundaries of the cell, surrounding the cell's protoplasm or contents. The protoplasm includes the nucleus, where the cell's DNA is compartmentalized, and the remaining contents of the cell (the cytoplasm). The eukaryotic cell's organelles include the nucleus, mitochondria, endoplasmic reticulum, Golgi apparatus, lysosomes, peroxisomes, cytoskeleton, and plasma membrane (Fig. 1). The organelles occupy approximately half the total volume of the cytoplasm. The remaining compartment of cytoplasm (minus organelles) is referred to as the cytosol or cytoplasmic ground substance. Eukaryotic cells also differ from prokaryotic cells in having a cytoskeleton that gives the cell its shape, its capacity to move, and its ability to transport organelles and vesicles from one part of the cell cytoplasm to another. Eukaryotic cells are generally larger than prokaryotic cells and therefore require a cytoskeleton and membrane skeleton to maintain their shape, which is related to their functions. Eukaryotic cells contain a large amount of DNA (about a thousandfold more than bacterial cells), only approximately 1% of which encodes protein. The remaining DNA is structural (involved in DNA packaging) or regulatory (helping to switch on and off genes). Plant cells are distinguished from other eukaryotic cells by various features. Outside their plasma membrane, plant cells have an extremely rigid cell wall. This cell wall is composed of cellulose and other polymers and is distinct in composition from the cell walls found in fungi or bacterial cells. The plant cell wall expands during cell growth, and a new cell wall partition is created between the two daughter cells during cell division. Similar cell walls are not observed in animal cells (Fig. 2). 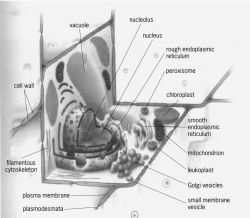 Most plant cells contain membrane-encapsulated vacuoles as major components of their cytoplasm. These vacuoles contain water, sucrose, ions, nitrogen-containing compounds formed by nitrogen fixation, and waste products. (mirror cell) The enclosure that holds the primary mirror in a reflecting telescope. It must hold the mirror so that the collimation of the optical elements is maintained as the direction of observation changes. It must also support the mirror so that it does not sag to an unacceptable degree under its own weight. Without carefully designed support over the whole rear face the mirror of the 5-meter Hale telescope would sag by 0.0625 mm, which is about 500 times the allowable quarter wave limit. The cell is usually provided with a closure or lid that protects the optical surface when the telescope is not in use. A small compartment, such as a room in a dormitory, but especially a confined study-bedroom allotted to a monk or nun in a monastery. an elementary living system capable of independent existence and self-replication and development; the basis of the structure and life processes of all animals and plants. Cells exist both as independent organisms (protozoans) and as component elements of multicellular organisms (tissue cells). The term “cell” was proposed by the English microscopist R. Hooke in 1665. The cell is the object of study of a special branch of biology called cytology. Systematic study of the cell did not begin until the 19th century; one of the most important scientific generalizations of that time was the cell theory, which asserted the structural unity of all living things. The study of life at the cellular level is the basis of contemporary biological research. The structure and functions of each cell show certain characteristics common to all cells, reflecting a common origin from primary organic complexes. The specific features of various cells are the result of specialization in the process of evolution. All cells similarly regulate metabolism, duplicate and use hereditary material, and acquire and utilize energy. At the same time, various unicellular organisms (amoebas, infusorians) differ sharply in terms of size, shape, and behavior. No less diverse are the cells of multicellular organisms. For example, in man, lymphoid cells are small (about 10 microns in diameter) and rounded and participate in immunological reactions, whereas some nerve cells have appendages more than a meter long and perform the body’s basic regulatory functions. Research methods. The first cytological method was the use of microscopy with living cells. Present-day variants of light microscopy, such as phase-contrast, luminescent, and interference microscopy, make it possible to study the shape of the cell, the general structure of some of its elements, the movement of cells, and cell division. The details of cell structure can be revealed only after special contrasting, which is achieved by staining the killed cell. A new stage in the study of cell structure is the use of the electron microscope, which has the advantage of considerably greater resolution of cell structures than the light microscope. The chemical composition of the cell is studied by cytochemical and histochemical methods, making it possible to reveal the localization and concentration of various substances in cellular structures, the intensity of synthesis of these substances, and the movement of the substances within the cell. Cytophysiological methods make it possible to study certain functions of the cell, such as excitation and secretion. General properties. Every cell has two principal parts—the nucleus and the cytoplasm. Within each of these it is possible to distinguish certain substructures, which differ in shape, size, internal structure, chemical properties, and function. Some of these, called organoids, are vital to the cell and in fact are found in all cells. Others are the products of cell activity and represent temporary formations. The segregation of various biochemical functions takes place by means of these specialized structures, facilitating the accomplishment within the same cell of diverse processes, including the synthesis and decomposition of many substances. Genetic information on the structure of the proteins characteristic of an organism of a particular species is stored in DNA (deoxyribonucleic acid), the principal component of nuclear organoids called chromosomes. Another, most important property of DNA is its capacity for self-replication, which ensures both the stability of the hereditary information and its continuity— that is, its transmission to succeeding generations. Ribonucleic acids, the immediate participants in protein synthesis, are synthesized on limited sections of the DNA molecule (embracing several genes), which act as templates. The transcription of the DNA code is accomplished by the synthesis of messenger RNA (m-RNA). Protein synthesis is, in effect, a reading of information from the RNA template. This process, called translation, involves the participation of transfer RNA (t-RNA) and special organoids, called ribosomes, that are formed in the nucleolus. The size of the nucleolus is a function chiefly of the cell’s ribosome requirement; the nucleolus is, therefore, especially large in a cell that intensively synthesizes proteins. Protein synthesis, the end result of chromosome function, occurs mainly in the cytoplasm. In the final analysis, proteins (comprising enzymes, components of cell structures, and the regulators of various processes, including transcription itself) determine all aspects of cell life, permitting the cell to preserve its individuality despite its constantly changing surroundings. Whereas the bacterial cell may synthesize about 1,000 different proteins, almost every human cell synthesizes more than 10,000. Thus, the diversity of intracellular processes increases substantially in the course of evolution. The sheath surrounding the nucleus, which separates the nuclear content from the cytoplasm, actually consists of two membranes, both of which are perforated by pores—specialized areas for the transport of certain compounds from the nucleus into the cytoplasm and vice versa. Other substances pass through the membranes by means of diffusion or active transport, the latter process requiring the expenditure of energy. Many processes occur in the cytoplasm with the participation of the membranes of the endoplasmic reticulum (the principal synthesizing system of the cell), the Golgi apparatus, and the mitochondria. The differences in the membranes of various organoids are determined by the properties of the proteins and lipids that form them. Ribosomes are attached to some of the membranes of the endoplasmic reticulum. These are the site of intensive protein synthesis. This type of granular endoplasmic reticulum is especially well developed in secretory cells or in cells that intensively renew proteins, such as human liver cells, pancreas cells, and nerves. Other biological membranes that are lacking in ribosomes (smooth reticulum) are made up in part of enzymes that participate in the synthesis of carbohydrate-protein and lipid complexes. The products of cell activity may accumulate temporarily in the canals of the endoplasmic reticulum; in some cells the substances are actually transported through these canals. Before being carried out of the cell, substances are concentrated in the lamellar Golgi apparatus, which isolates various cell inclusions, such as secretory or pigment granules, and in which lysosomes are formed (sacs containing hydrolytic enzymes and participating in the intracellular digestion of many substances). The system of canals, vacuoles, and sacs, all surrounded by membranes, acts as an integrated unit; the endoplasmic reticulum can, without interruption, connect to the membranes surrounding the nucleus, unite with the cytoplasmic membrane, and form the Golgi complex. However, these connections are not stable. Often (in many cells, usually), the various membranous structures are discrete and exchange substances through the hyaloplasm. Cell energetics depends to a large extent on the work of the mitochondria. The number of mitochondria varies in different types of cells from dozens to several thousand. For example, there are about 2,000 mitochondria in the human liver cell, and their total volume is no less than one-fifth the volume of the cell. The outer membrane of the mitochondrion separates it from the cytoplasm. The basic energy conversions of substances occur on the inner membrane. A result of these conversions is the formation of a compound rich in energy—adenosine triphosphoric acid (ATP)—the universal carrier of energy in the cell. Mitochondria contain DNA and are capable of self-replication. However, the autonomy of the mitochondria is relative: their reproduction and activities depend on the nucleus. Various syntheses, the transport and excretion of substances, mechanical work, and the regulation of processes in the cell are performed using the energy of ATP. Certain structures that look like tiny (submicroscopic) tubules participate in cell division and, sometimes, in cell movement. The assembling and functioning of such structures depend on the centrioles. The spindle, operative in cell division, is organized with the participation of the centriole. The spindle, in turn, participates in the translocation of chromosomes and the orientation of the axis of cell division. The basal bodies, derivatives of the centrioles, are necessary for the construction and normal functioning of flagella and cilia, locomotor and sensory formations of the cell whose structure is the same in protozoans and various metazoan cells. The cell is separated from the extracellular medium by the plasma membrane, through which ions and molecules enter the cell and are excreted from it. The ratio of the cell’s surface to its volume decreases as cell volume increases; the larger the cell, the more difficult are its connections with the external medium. The size of a cell, therefore, is necessarily limited. Active ion transfer, which requires the expenditure of energy and requires special enzymes and, possibly, carrier agents, is characteristic of living cells. Because of the active and selective transfer of certain ions into the cell and the continuous removal of others from it, a difference is created between the ion concentration within the cell and that of the surrounding medium. This effect may be caused by the bonding of ions with cell components. Many ions are necessary as activators of intracellular syntheses and as stabilizers of the structure of the organoids. Reversible changes in the ratio of the ions within the cell to those in the medium are the basis of the cell’s bioelectric activity—one of the most important factors in the transmission of signals from one cell to another. The plasma membrane, by forming invaginations which then close up and break off as bubbles within the cell, is capable of capturing solutions of large molecules (pinocytosis) or even certain particles with diameters to several microns (phagocytosis). It is in this way that some cells are nourished, that some substances are transferred through the cells, and that bacteria are captured by phagocytes. The cohesive forces that in many cases keep cells close to one another (for example, the integuments of the body or internal organs) are also associated with the properties of the plasma membrane. Cellular cohesion and intercommunication are ensured by the chemical interactions of the membranes and by special structures of the membrane called desmosomes. The structural scheme of cell, discussed in its general form, is characteristic in its basic features of both animal cells and plant cells. However, there are essential differences in the characteristics of the metabolism and structure of plant cells and animal cells. Plant cells. As a rule, the plasma membranes of plant cells are covered with a rigid outer sheath (possibly absent only in the germ cells) consisting in the majority of plants mainly of polysaccharides: cellulose, pectic substances, hemicelluloses, and, in fungi and some algae, chitin. These cell walls are supplied with pores through which, by means of cytoplasmic outgrowths, neighboring cells can communicate with one another. The composition and structure of the wall change with the growth and development of the cell. In cells that have ceased growing, the envelope often becomes impregnated with lignin, silica, or other toughening matter. The cell walls determine the mechanical properties of the plant. The cells of certain plant tissues have especially thick and sturdy walls that retain their skeletal functions even after the death of the cell (wood). Differentiated plant cells have several vacuoles or a single central vacuole that usually occupies the greater part of the cell’s volume. The vacuoles contain a solution of various salts, carbohydrates, organic acids, alkaloids, amino acids, and proteins, as well as a reserve of water. Nutritive substances may also be deposited in the vacuoles. The cytoplasm of plant cells contains special organoids, or plastids, including leucoplasts (in which starch is often deposited), chloroplasts (containing predominantly chlorophyll and responsible for photosynthesis), and chromoplasts (containing carotenoid pigments). Both plastids and mitochondria are capable of self-replication. The Golgi apparatus in plant cells is represented by dictyosomes, which are dispersed throughout the cytoplasm. Unicellular organisms. The structure and functions of unicellular organisms, or protozoans, combine the features characteristic of any cell with features of independent organisms. Thus, protozoans have the same set of organoids as do the cells of metazoans, the ultrastructure of their organoids is identical, and typical chromosomes are found when protozoans divide. However, the adaptation of protozoans to a variety of modes of life (aquatic or terrestrial, free-living or parasitic) has made for considerable diversity in their structure and physiology. Many protozoans, such as flagellates and infusorians, have a complex motor apparatus and organelles associated with the capture of food and digestion. The study of protozoans is of great interest in uncovering the phylogenetic possibilities of the cell, since evolutionary changes in the organism occur on the cellular level. Unlike protozoans and the cells of metazoans, bacteria, blue-green algae, and actinomycetes do not have a formed nucleus and chromosomes. Their genetic apparatus, called a nucleoid, is represented by threads of DNA and is not enclosed in a membrane. Even more different from the cells of metazoans and protozoans are the viruses, in which the basic enzymes necessary for metabolism are absent. For this reason viruses can grow and reproduce only by penetrating other cells and making use of their enzyme systems. Special functions. During the course of metazoan evolution there arose a division of functions between cells, which in turn led to a broadening of the adaptive possibilities of animals and plants to changing environmental conditions. The genetically fixed differences in the shape, size, and aspects of the metabolism of cells are realized during the process of individual development. The principal manifestation of development is cell differentiation—the structural and functional specialization of the cell. Differentiated cells have the same set of chromosomes as the fertilized egg cell; this is proved by the fact that after the nucleus of a differentiated cell is transplanted into an egg cell from which the nucleus has been removed, a complete organism is able to develop. Thus, the differences between differentiated cells are apparently determined by various interrelationships between active and inactive genes, each of which codes the biosynthesis of a particular protein. Judging by the composition of these proteins, only a small proportion (about 10 percent) of the genes characteristic of the cells of a given species are active (that is, capable of transcription) in differentiated cells. Of these genes, only a few are responsible for the specialized function of the cell, while the rest provide for general cellular functions. For example, in muscle cells, genes are active that code the structure of contractile proteins, and in erythroid cells, genes are active that code the biosynthesis of hemoglobin. However, in every cell the genes that determine the biosynthesis of the substances and structures necessary to all cells, such as the enzymes that participate in energy conversions, must also be active. In the process of cell specialization, certain general cellular functions may develop especially strongly. For example, in gland cells, synthetic activity is most strongly expressed; muscle cells are the most contractile; nerve cells are the most excitable. Narrowly specialized cells contain structures that are peculiar to themselves (for example, in animals, the myofibrils of muscles, the tonofibrils and cilia of certain integumentary cells, and the neurofibrils of nerve cells; in protozoans or the spermatozoa of metazoans, flagella). Sometimes specialization is accompanied by the loss of certain properties (for example, nerve cells lose their capacity to reproduce; the mature cell nuclei of mammalian intestinal epithelium cannot synthesize RNA; the mature erythrocytes of mammals lack nuclei). The performance of functions important to the organism sometimes includes the death of the cell. Thus, cells of the epidermis gradually cornify and die but remain for some time in a thin layer protecting the underlying tissues from damage and infection. Cells in the sebaceous glands gradually turn into drops of fat, which is then either utilized by the body or excreted. Noncellular structures are also formed by the cell in order to perform certain tissue functions. The principal means of their formation are secretion or the transformation of cytoplasmic components. For example, a large proportion of the volume of subcutaneous tissue, cartilage, and bone is interstitial matter— a derivative of connective-tissue cells. Blood cells are found in a fluid medium (blood plasma) that contains proteins, sugars, and other substances produced by various cells of the body. Epithelial cells, which form a sheet, are surrounded by a thin interlayer of diffusely distributed substances. Chief among these are glycoproteins (so-called cement, or supramembranal component). The outer coverings of arthropods and the shells of mollusks are also products of cellular secretion.The interaction of specialized cells is a necessary condition for the life of the organism and often for the cells themselves. Deprived of communication with one another (for example, in culture), cells rapidly lose their characteristic features of specialized function. Cell division. The basis of the cell’s capacity to reproduce itself is the unique property of DNA to copy itself and the strictly equal division of the reproduced chromosomes in the process of mitosis. The result of division is the formation of two cells that are identical to the original in genetic properties and contain both nucleus and cytoplasm. The processes of chromosomal self-replication and division, formation of two nuclei, and cytoplasmic division are distributed over time; in sum, they constitute the mitotic cycle of the cell. If the cell begins to prepare for the next division immediately after dividing, the mitotic cycle coincides with the life cycle of the cell. However, in many cases, after division (and sometimes before it) the cell emerges from the mitotic cycle, becomes differentiated, and fulfills some special function in the body. The contents of such cells may be renewed at the expense of the divisions of only slightly differentiated cells. In some tissues, differentiated cells too are capable of repeatedly entering the mitotic cycle. In nerve tissue, differentiated cells do not divide; many of them live throughout the life of the whole organism (that is, in man, several decades). Nevertheless, the nuclei of the nerve cells do not lose their capacity for division; transplanted into the cytoplasm of cancerous cells, they synthesize DNA and divide. Experiments with hybrid cells show the influence of the cytoplasm on the manifestation of nuclear functions. Imperfect preparation for division prevents mitosis or distorts its course. Thus, in some cases, cytoplasmic division fails to take place and a binuclear cell is formed. The outcome of repeated nuclear divisions in a nondividing cell is the appearance of multinuclear cells or complex supracellular structures, or symplasts (for example, in striated muscle). Sometimes reproduction of the cell is limited to reproduction of the chromosomes, and a polyploid cell forms with a double set (compared to the parent cell) of chromosomes. Polyploidy leads to the intensification of synthetic activity and to an increase in the size and mass of the cell. Cell renewal. In order to work properly over an extended period, every cell must have its worn-out structures restored and the externally induced damages to it eliminated. The restorative processes characteristic of all cells are associated with changes in the permeability of the plasma membrane and are accompanied by the intensification of intracellular synthesis (most importantly, of proteins). In many tissues, stimulation of the renewal processes leads to reproduction of the genetic apparatus and division of the cell; this is characteristic, for instance, of the integuments or the hemopoietic system. The processes of intracellular renewal in these tissues are weakly expressed, and their cells live a comparatively short time (for example, cells of the intestinal integument of mammals live only a few days). Intracellular renewal processes attain their maximum expression in nondividing or slowly dividing cell populations, such as nerves. The indicator of the perfection of the internal renewal processes of the cell is the cell’s life-span; for many nerve cells this coincides with the life-span of the organism itself. Mutations. The process of DNA replication usually occurs without deviation and the genetic code remains constant, ensuring the synthesis of the same set of proteins in an enormous number of cell generations. However, in rare instances, mutation may occur—that is, a change in part of the structure of the gene. The ultimate effect of mutation is a change in the properties of the proteins coded by the mutant genes. If important enzyme systems are affected, the properties of the cell (sometimes of the entire organism) may be changed substantially. For example, mutuation of one of the genes controlling hemoglobin synthesis leads to anemia, a serious condition. Natural selection of useful mutations, on the other hand, is an important mechanism of evolution. Regulation of cell function. The principal regulatory mechanism of the intracellular processes is associated with various influences on enzymes. Enzymes are highly specific catalysts of biochemical reactions. Regulation may be directly genetic, the composition of the enzymes or the quantity of a given enzyme in the cell being predetermined. In the case of enzyme quantity, regulation may also occur on the level of translation. Another type of regulation is influence on the enzyme itself, as a result of which the enzyme’s activity may be either inhibited or stimulated. Regulation on the structural level influences the assembly of cellular structures (membranes, ribosomes, and so forth). More concrete regulators of intracellular processes include nervous influences, hormones, special substances produced within the cell or by surrounding cells (especially proteins), or the products of the intracellular reactions themselves. In this last case, the effect is accomplished by a feedback principle in which the product of a reaction influences the activity of the enzyme that is the catalyst of the initial reaction. Other regulatory mechanisms include the transport of precursors and ions, influences on template synthesis (RNA, polysomes, synthesis enzymes), and alteration of the form of a regulated enzyme. The organization and regulation of cell function on the molecular level determine such properties of living systems as spatial compactness and economy of energy. An important property of multicellular organisms—reliability—depends in great part on the number (interchangeability) of cells of each functional type and on the possibility of their replacement through cellular reproduction and renewal of the components of each cell. In medicine, changes can be induced in the cell to treat and prevent various diseases. Many medicinal substances change the activity of certain cells. Narcotics, tranquilizers, and analgesics lower the intensity of neural activity; stimulants increase it. Some substances stimulate contraction of the muscle cells of the blood vessels. Others stimulate a similar reaction in the muscles of the uterus or heart. Dividing cells can be affected by radiation or cytostatic substances (blocking cell division). Immunization stimulates the activity of the lymphoid cells, which manufacture antibodies against foreign proteins, and thereby prevents a number of diseases. Kol’tsov, N. K. Organizatsiia kletki. Moscow-Leningrad, 1936. Nasonov, D. N., and V. Ia. Aleksandrov. Reaktsiia zhivogo veshchestva na vneshnie vozdeistviia. Moscow-Leningrad, 1940. Kedrovskii, B. V. Tsitologiia belkovykh sintezov v zhivotnoi kletke. Moscow, 1959. Rukovodstvo po tsitologii, vols. 1–2. Moscow-Leningrad, 1965–66. Brodskii, V. Ia. Trofika kletki. Moscow, 1966. Vasil’ev, Iu. M., and A. G. Malenkov. Kletochnaiapoverkhnost’ i reaktsii kletok. Leningrad, 1968. Alov, I. A., A. I. Braude, and M. E. Aspiz. Osnovy funktsional’noi morfologii kletki, 2nd ed. Moscow, 1969. Handbook of Molecular Cytology. Edited by A. Lima-de-Faria. Amsterdam, 1969.
a living area in a monastery. Most of the Russian monasteries permitted the construction of a personal cell for each monk or nun. As a result, monks from rich families had comfortable, spacious cells. The microscopic functional and structural unit of all living organisms, consisting of a nucleus, cytoplasm, and a limiting membrane. An elementary unit of data storage. In a spreadsheet, the intersection of a row and a column. A single unit of a battery. A manufacturing unit consisting of a group of work stations and their interconnecting materials-transport mechanisms and storage buffers. The homeomorphic image of the unit ball. One of the (n- 1)-dimensional polytopes that enclose a given n-dimensional polytope. A compartment in a flotation machine. One of a set of elementary regions in a heterogeneous reactor, all of which have the same geometrical form and the same neutron characteristics. A cup, jar, or vessel containing electrolyte solutions and metal electrodes to produce an electric current (conductiometric or potentiometric) or for electrolysis (electrolytic). 2. A single small cavity surrounded partially or completely by walls. 3. A segment of a ribbed vault. 4. The small sleeping apartment of a monk or a prisoner. 5. In electrical systems, a single raceway of a cellular or underfloor duct system. 6. In electrical batteries, a single voltage-producing component used in series with other similar components to provide the desired output voltage. In a spreadsheet, the intersection of a row a column and a sheet, the smallest addressable unit of data. A cell contains either a constant value or a formula that is used to calculate a value. The cell has a format that determines how to display the value. A cell can be part of a range. A cell is usually referred to by its column (labelled by one or more letters from the sequence A, B, ..., Z, AA, AB, ..., AZ, BA, BB, ..., BZ, ... ) and its row number counting up from one, e.g. cell B3 is in the second column across and the third row down. A cell also belongs to a particular sheet, e.g. "Sheet 1". ATM's term for a packet. (1) A geographic area in a cellular phone system. See cellphone. (2) In a spreadsheet, the intersection of a row and column. (4) An elementary unit of storage for data (bit) or power (battery). A and B, The follicular cells show atypia but lack sufficient cytologic and architectural criteria for the diagnosis of papillary thyroid carcinoma (hematoxylin-eosin, original magnifications X200 [A] and X400 [B]). knerii 17 TABLE 2 Gonadosomatic Index (GSI) and oocyte diameter (DO), cortical alveoli's vesicles diameter (CA), pellucid zone thickness (ZP) and follicular cells height (FC) of vitellogenic oocytes of six species of Anostomidae from the Sao Francisco River basin, Minas Gerais, Brazil GSI Species Males Females L.
Rahman MMA, Fetouh FA (2013) Effect Of Sodium Fluoride On The Thyroid Follicular Cells And The Amelioration By Calcium Supplementation In Albino Rats: A Light And An Electron Microscopic Study. Case 5: Cytological smears showed hypocellular smears with occasional thyroid follicular cells and moderate amount of thin colloid favoring the diagnosis of a colloid cyst. It is made up of three principal components; the lining follicular cells the basal parafollicular cells and the luminal colloid. At ~180 [micro]m (primary follicles) follicular cells become cuboids and arrayed in one layer (Figure 4), between them there are a great number of the globed-shaped cells (Figure 5). 4] levels and increased TSH) and induced thyroid follicular cell hypertrophy in male rats after a 2-week exposure period (De Sandro et al. Histopathological study showed follicular cell derived lesions (FCL) in 2142 (99. 87,89,117) As explained earlier, the pathologic features of thyroid involvement are very similar to those of other organs affected in the systemic form of IgG4-RD, (90) especially autoimmune pancreatitis (as more than one-third of affected patients (118) have some form of thyroiditis as well, (90,119) and include diffuse lymphoplasmacytic infiltration, lymphoid follicle formation with germinal centers, dense stromal fibrosis, and follicular cell destruction (Figure 7, A through C). Wet weight, length, thyroid hormone content (adjusted for extraction efficiency), and follicular cell heights were analyzed using Kruskal-Wallis one-way ANOVA on ranks with Dunn's test for multiple comparisons. Genetic alterations during follicular cell proliferation lead to neoplastic transformation. Thyroglobulin is the primary synthetic product of the thyroid and the macromolecular precursor of thyroid hormones (T3 and T4), serving as a specific marker for thyroid follicular cell origin.